1دانش آموخته کارشناسی ارشد اگرواکولوژی، دانشکده کشاورزی، دانشگاه بیرجند. این پژوهش به‌منظور مطالعه و ارزیابی خاصیت آللوپاتیک عصاره آبی برگ و بنه زعفران بر جوانه‌زنی و شاخص‌های رشد گیاهچه علف پشمکی و خاکشیر (دو علف هرز رایج مزارع زعفران) در سال 1392 در آزمایشگاه تحقیقاتی دانشکده کشاورزی دانشگاه بیرجند انجام شد. آزمایش برای هر گونه علف هرز به‌صورت فاکتوریل در قالب طرح کاملاً تصادفی با سه تکرار انجام شد. تیمارهای آزمایش شامل نوع اندام زعفران در دو سطح (برگ و بنه) و غلظت عصاره در 5 سطح (0، 5/0، 1، 5/1 و 2 درصد وزنی-حجمی عصاره آبی) بود. غلظت‌های مختلف عصاره برگ و بنه زعفران درصد جوانه‌زنی هر دو گونه علف هرز را کاهش داد. کمترین درصد جوانه‌زنی علف پشمکی و خاکشیر به ترتیب با 65 و 66 درصد کاهش نسبت به شاهد از تیمارهای غلظت 2 درصد عصاره بنه حاصل شد. سرعت جوانه‌زنی علف پشمکی در غلظت 2 درصد عصاره برگ نسبت به شاهد 71 درصد کاهش یافت ولی سرعت جوانه‌زنی خاکشیر تحت تأثیر غلظت‌های متفاوت عصاره برگ و بنه قرار نگرفت. همچنین غلظت‌های متفاوت عصاره برگ و بنه زعفران شاخص‌های طول ساقه‌چه و ریشه‌چه و وزن ساقه‌چه و ریشه‌چه را در گونه‌های مورد مطالعه کاهش داد. برازش مدل لجستیک سه پارامتری، رابطه بین سطوح مختلف عصاره آبی و درصد جوانه‌زنی بذور علف پشمکی و خاکشیر را به‌خوبی توجیه نمود. نتیجه مقایسات گروهی بین عصاره برگ و بنه زعفران نشان داد که بیشترین اثر بازدارندگی صفات در علف پشمکی مربوط به عصاره برگ و در خاکشیر مربوط به عصاره بنه زعفران بود. This study was conducted in two factorial experiment based on completely randomized design with three replications at research laboratory of faculty of agriculture in University of Birjand in 2013. Factors included saffron organs at 2 levels (leaves and corms) and water extract concentrations at 5 levels (0, 0.5, 1, 1.5 and 2 percent).The allelopathic effects of saffron leaves and corms on seed germination and seedling growth characteristics of flixweed (Descurainia sophia L.) and downy brome (Bromus tectorum L.) were studied in two separate experiments. Results indicated lowest seed germination percentage of downy brome and flixweed were observed at concentration of 2% of corm extract (by 65% and 66% reduce compared to control, respectively). The rate of germination of downy brome decreased (by 71% compared to control) with concentration of 2% of leaf extract but the rate of germination on flixweed was not significantly affected by extract concentrations. Different concentrations of leaf and corm extracts significantly decreased length and weight of plumule and radicals of two weeds. A logistic model provided a successful estimation of relationship between leaf water extract and germination percentage of two weeds. Based on orthogonal comparison tests, the allelopathic inhibition effects of saffron leaves and corms were more on downy brome and flixweed, respectively. Abbasi, F., and Jahani, M. 2007. Allelopathic effects of saffron corms on seed germination of several important crops. 2nd International Symposium on Saffron Biology and Technology, Mashhad, Iran, 1 April 2007, p. 250-256. Alimoradi, L., Azizi, G., Jahani, M., Siah-Marguee, A., and Keshavarzi, A. 2008. Allelopathy as an alternative method for weed control in saffron fields: A suitable approach to sustainable agriculture. Competition for resources in a changing world: New drive for rural development, Stuttgart, 7-9 Octobre 2008, p. 127-145. (In Persian with English summary). Amirghasemi, T. 2001. Saffron, Iranian Red Gold. Cultural Institution Publication Posterity Press. p.70-110. Asgharipour, M.R., Rashed-Mohassel, M.H., Rostami, M., and Eizadi, E. 2006. The allelopathic potential of saffron (Crocus sativus L.) on following crop in rotation. 2nd International symposium on saffron biology and technology, Mashhad, Iran, 28-30 October 2006, 48 p.
Azizi, M., Alimoradee, L., and Rashed-Mohassel, M.H. 2006. Allelopathic effects of Bunium persicum and Cuminum cyminum essential oils on seed germination of some weeds species. Iranian Journal of Medicinal and Aromatic Plants 22: 198-208. (In Persian). Behnia, M.R. 1991. Saffron: Botany, Cultivation and Production. Tehran University Press. p. 85-150. Chauhan, B.S., Gill, G., and Preston, C. 2006. Factors affecting seed germination of annual sowthistle (Sonchus oleraceus) in southern Australia. Weed Science 54: 854-860. Eghbali, S., Rashed-Mohassel, M.H., Nassiri-Mahallati, M., and Kazerooni-Monfared, E. 2007. Allelopathic potential of shoot and corm of saffron residues on wheat, rye, vetch and bean. Iranian Journal of Agricultural Research 6: 227-234. (In Persian). Fernandez, J.A., Escribano, J., Piqueras, A., and Medina, J. 2000. A glycoconjugate from corms of saffron plant (Crocus sativus L.) inhibits root growth and affects in vitro cell viability. Journal of Experimental Botany 51: 731-737. Hashemi Nia, S.M., Nassiri Mahallati, M., and Keshavarzi, A. 2009. Determining the threshold salinity and appropriate temperature and their combined effects on germination of Cuminum cyminum. Iranian Journal of Agrcultral Research 7 (1): 303-310. Hejazi, A. 2000. Allelopathy. Tehran University Press. p. 324-325. Hosseini, M., and Rizvi, S.J.H. 2007. A preliminary investigation on possible role of allelopathy in saffron (Crocus sativus L.) 2nd International Symposium on Saffron Biology and Technology. Mashhad, Iran, 1 April 2007, p. 75-80. Inderjit, K.I. 1999. Allelopathy: principles. Procedures, processes, and promises for biological control. Advance Agronomy 67: 141-231. Ismail, B.S., and Chong, T.V. 2002. Effect of aqueous extract and decomposition of Mikania micrantha on selected agronomic crops. Weed Biology and Management 2: 31-38. Joung, K.A., and Chung, I.M. 2000. Allelopathic potential of rice hulls on germination and seedling growth of barnyard grass. Agronomy Journal 92: 1162-1167. Kafi, M., Rashed Mohassel, M.H., Koocheki, A., and Mollafilabi, A. 2002. Saffron (Crocus sativus L.), Production and Processing. Center of excellence for agronomy. Faculty of Agriculture Ferdowsi University of Mashhad, Iran. p. 68-80. Karimi, H. 1995. Iran Weeds. Academic Publication Center Press. p. 3-8. Kobayashi, K. 2004. Factors affecting phytotoxic activity of allelochemicals in soil. Weed Biology and Management 4:1-7. Kohli, R.K., Singh, H.P., and Batish, D.R. 2001.Allelopathy in Agroecosystems. Food Products Press, USA. 447 p.
Makkizadeh, M., Salimi, M., and Farhoudi, R. 2009. Allelopathic effect of rue (Ruta graveolens L.) on seed germination of three weeds. 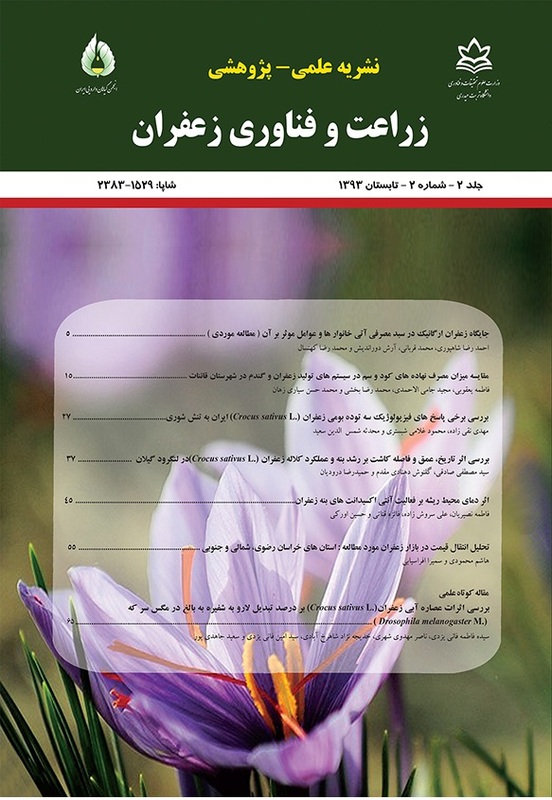 Iranian Journal Medicinal Aromatic Plants 24: 463-471. (In Persian). Meyghani, F. 2003. Allelopathy from Concept to Application. Incident Beam Press. p. 41-107. Mojab, M., and Mahmodi, M. 2008. Allelopathic effects of shoot and root water extracts of Hoary cress (Cardaria draba) on germination characteristic and seedling growth of Sorghum (Sorghum bicolor L.). Elektronik Journal Crop Production 1 (4): 65-78. Ohno, T.K., Doolan, L.M., Zibilske, M., Liebman, E., Gallandt, R., and Berube, C. 2000. Phytotoxic effects of red clover amended soils on wild mustard seedling growth. Agriculture, ecosystems and environment 78: 187-192. Qasem, J.R. 1992. Pigweed (Amaranthus spp) interference in transplanted tomato (Lycopersicom esculentum). Horticultural Science 67: 421-427. Rashed-Mohessel, M.H., Gherekhloo, J., and Rastgoo, M. 2009. Allelopathic effects of saffron (Crocus sativus L.) leaves and corms on seedling growth of redroot pigweed (Amaranthus retroflexus) and lambsquarter (Chenopodium album). Iranian Journal of Agricultural Research 7: 53-61. (In Persian). Rice, E.L. 1979. Allelopathy –an update. Botanical Review 45: 15-109. Rizvi, S.J.H., and Rizvi, V. 1992. Allelopathy: Basic and Applied Aspects (London, U.K. Chapman and Hall). Springer press. 392 p.
Seigler, D.S. 1996. Chemistry and mechanism of allelopathic interaction. Agronomy Journal 88: 876-885. Soltani, A., Galeshi, S., Zeinali, E., and Latifi, N. 2002. Germination, seed reserve utilization and seedling growth of chickpea as affected by salinity and seed size. Seed Science Technology 30: 51-60. (In Persian). Steinsiek, J.W., Oliver, L.R., and Collins, F.C. 1982. Allelopathic potential of wheat (Triticum aestivum) straw on selected weed species. Weed Science 30: 495-497. Tabrizi, L., Nssiri Mahallati, M., and Koocheki, A. 2004. Investigations on the cardinal temperatures for germination of Plantago ovata and Plantago psyllium. Iranian Journal of Agricultural Research 2: 143-151. (In Persian). Taheri, K., Saboora, A., and Kiarostami, K. 2011. Allelopathic effect of saffron (Crocus sativus L.) on germination and seedling growth of four sorghum (Sorghum bicolor L.) cultivars. Iranian Journal of Biology 24: 89-103. (In Persian). Whittaker, R.H., and Feeny, P.P. 1971. Allelochemics: Chemical interaction between species. Science 171: 757-770. Zand, A., Rahimian, M., Ashhadi, H., Koocheki, A., Khalghani, J., Mosavi, K., and Ramzani, K. 2004. Weed Ecology (Application Management). Mashhad University Press. 558 p. (Translated in Persian). Zeinali, E., and Ehteshami, M.R. 2003. Biology and Control of Important Weed Species. Gorgan University Press. p. 4-8. Zeinali, E., Soltani, A., Galeshi, S., and S.J. Sadati. 2010. Cardinal temperatures, response to temperature and range of thermal tolerance for seed germination in wheat (Triticum aestivum L.) cultivars. Elektronik Journal Crop Production 3 (3): 23-42.